This is a 1975 John Beam 1,000 GPM/high pressure engine. The high pressure was later disconnected. This unit is currently in service at station 3 as Engine 31. The jump seat was retrofitted with gates to allow personnel to ride there. 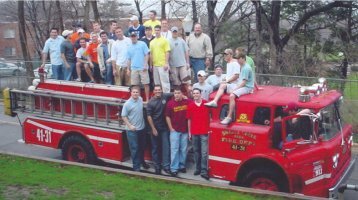 The Fireboard approved a purchase proposal from Pi Kappa Alpha Fraternity of East Lansing in the amount of $1,515.00 at the March 18, 2002 meeting. The official adoption photo from Pi Kappa Alpha Fraternity. This 3 units were purchased in 1979. 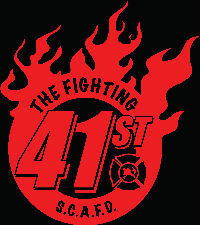 At the time, utilizing a quick unit for the initial attack was the standard for structure fires. However, in 1991, that policy was changed to only Class "A" pumper would be used for the initial interior attack. The first 2 vehicles above were purchased at the same time. The first by the City of Swartz Creek (41 Grass 17), the 2nd by Clayton Township (41 Pump 37). They were identical except the first had a bumper wench. Grass 17 is still in service at station 1. Pump 37 was deemed surplus and was sold in 1999 by Clayton Township. The 3rd vehicle (41 Grass 27) is currently in service at station 2. The pump was replaced in 1999 as the old one wasn't fixable due to the original manufacturer not being in business anymore. It was replaced with a Honda portable water pump. 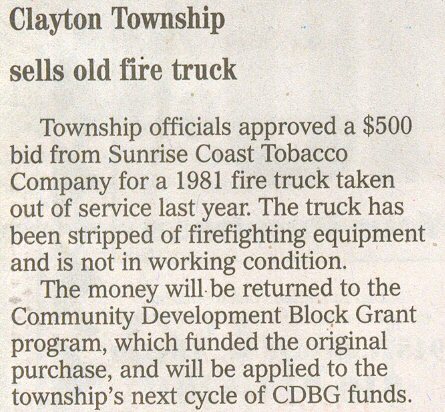 In October 2011, Clayton Township and the City of Swartz Creek approved an expenditure of $14,142.00, out of the Capital Improvement Fund Program to replace the skid unit on Grass 27. On December 7, 2011, the skid unit, manufactured by Danko Emergency Equipment arrived at station 2. Since the original vehicle was purchased with Community Development Funding, permission was received to remove, dispose of and replace the tank and pump. Stipulations were exchanged that indicated the skid unit would be removed if the original chassis should no longer be useful. Below are photos taken 12/13/11 of the original motor, replace years ago by a Honda water pump, the tank to be removed and the new Danko skid unit. The valves on the new skid unit are removed to prevent damage during installation. Installation was completed on December 24, 2011. Below are photos taken December 20, 2011. Below are photos of it completely installed. Thanks Eric! This is a 1981 John Beam 1,000 GPM 2 stage pump. This was the last unit that was purchased with high pressure pumping capabilities. However, due to the elimination of using high pressure, the pump usage was discontinued in the late 1980's. This unit was originally at station 1 as Engine 12, but was transferred to station 2 and re-numbered as Engine 22, when we received Engine 11 in 1999. On May 7, 2002, the engine was transferred to Station 3 and renumbered 31. On March 30, 2004, station 3 was vacated. Engine 31 had been out of service for some time due to unknown electrical problems. The article above was published in the Swartz Creek News on May 24, 2004. On May 28, 2004, Mark Scowden, of Sunrise Coast Tobacco Company, picked up E31 from station 2. On May 3, 2002, although officially assigned to station since the 1975 John Beam had been decommissioned, the ID number was officially changed to Engine 31. Below are the photos taken marking the event. 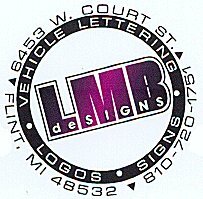 Decal work performed by Thanks Lynn!